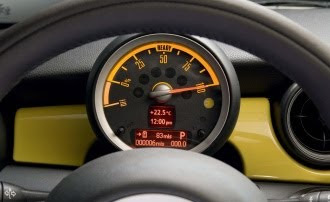 From the driver’s seat, the most obvious clue that you’re sitting in an electric Mini is the big dial behind the steering wheel. A sweep hand falls inexorably from 100 to 0 as you pile on the miles. Below this analogue dial is a small digital trip computer, which can be set to display remaining range in miles. BMW quotes a notional range of 100 miles per charge of its Mini E (it actually quotes 100 to 120 miles and 156 in ideal conditions, but with electric cars we’ve learned to look at the lowest number and work downwards). This means that the big dial ought to render the range predictor redundant – at 100% charge there should be at least 100 miles of motoring to go, and at 50% charge there should be roughly 50 miles remaining before you need to find a socket. Only of course it doesn’t work that way. We put the electric cabin heater on for five minutes at the start of our hour-long Mini E road test, and drove the whole route as we would a conventional fossil-fuel car. We soon saw the range prediction and the battery meter part company. After 32 miles on urban and rural roads, the range was down to 47 miles, while the dial said 55% remaining. Still, we suppose about 80 miles of electric motoring with warm toes isn’t bad, all things considered. 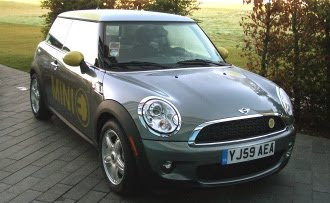 The Mini E is a development vehicle, rather than a potential product in its own right. BMW says it intends to launch a four-seat electric car “within the next four years”, and the Mini E is a mobile testbed for this “Mega City Vehicle”. Roughly speaking, we have a standard Mini with a motor and control electronics in place of an engine, and a huge battery where the back seats used to be. The battery weighs about a quarter of a tonne, and is conceptually similar to the power unit developed by Tesla Motors. Unlike, say, the bespoke flat-laminate batteries Nissan and Renault are making for their electric cars, the Mini and Tesla route to electrification is to buy job lots of cylindrical lithium-ion cells, of the kind usually destined for laptops. But whereas a MacBook might use three cells, the Mini swallows more than 5,000 of the things – built up in 48 bricks of 106 cells each. Overall, this power pack stores 35kWh, of which about 30kWh can be drained during normal driving, fed to the front wheels via a 150kW (200bhp) motor. The Mitsubisi i-Miev, for comparison, carries 16kWh and a employs a 47kW motor, while the Tesla Roadster has 56kWh on board and a 185kW motor. BMW is also keen to point out that 200bhp is more than the Mini Cooper S can muster – its 1.6-litre petrol engine peaks at 175bhp. The Mini E does indeed feel fast, but not Cooper S quick – carrying the 260kg battery is, after all, like having two 20-stone friends on board. Climbing in, you first have to remember to open the correct door – all Mini Es are left hookers. Slot the electronic keyfob into its dashboard recess, and press the small stop-start button. The battery gauge swings into life as the power pack readies itself in complete silence. The cells are actively cooled, with air drawn through a grille behind the front seats and expelled under the car, but we couldn’t detect the whirring of fans. The gear selector is standard auto stuff – push down on the brake pedal and depress the chrome safety catch to pull the lever back into D.
Release the brakes and – nothing. The car won’t creep forward until you give it a tickle of throttle. Once on the move, the car pulls away strongly but very controllably, with plenty of urge on offer. Give it a bit of welly and the car will just squat and go, producing a very satisfying turbine-like whine. Nought to 62mph takes just 8.5 seconds, and we have no doubt that the car will reach its limited 95mph top speed. Actually, the delivery is not entirely clean and linear. Feed in power gently and you won’t notice any gaps, but stamp on the throttle from a standstill – lunging for a gap on a roundabout, say – and the car will pause, motionless, for just long enough to send your heart to your mouth. There’s a similar non-linearity to the regenerative braking. The regen is set up much more aggressively than in other electric cars we’ve driven – it doesn’t feel like conventional engine braking, it feels like you’re pressing the brake. But this unusual response takes half a second to arise – lift off suddenly and press on again in less than half a second and you won’t slow down at all. This makes for an unusual driving style that takes some getting used to. In normal driving you don’t touch the brakes at all – you drive everywhere simply by adjusting the throttle. Sensibly, BMW has set up the Mini so that the brake lights come on as soon as you lift the go-faster pedal. According to Alexander Thorwirth, head of alternative drives at BMW, aggressive regeneration is the optimum approach, even if it feels odd. “We will see how it goes in the trial, but we think electric cars require some behavioural change and that includes adjusting to how the vehicle works,” he says. We get where he’s coming from, but we wonder if it might be dangerous to adapt to a driving style where you rarely touch the brakes. Odd pedal actions aside, the Mini E felt like a very mature package – much closer to a viable production vehicle than we’d expected. It’s very fast, reasonably responsive, handles and rides well and feels as agile as a Mini should. The range might be limited, but no more so than other electric cars. True, there are no back seats and no boot to speak of – a suitcase would have to travel atop the battery. 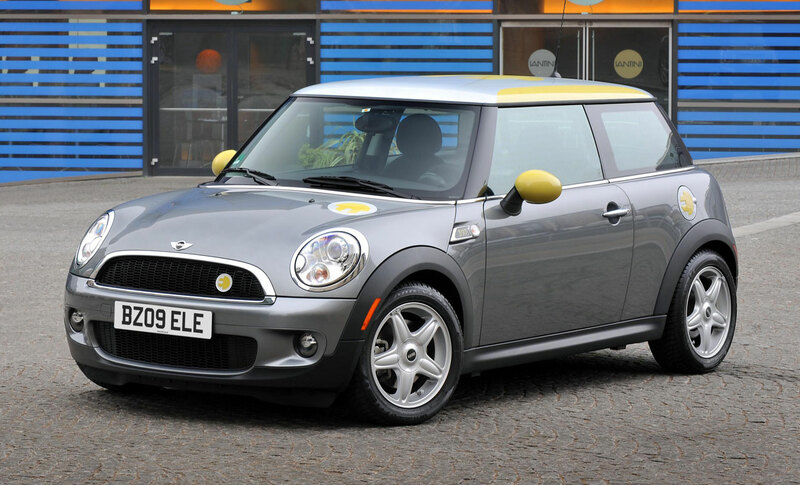 We’re not sure we’d want to spend £330 a month to lease a Mini E though, particularly not in a six-month market trial. But apparently there are lots of people willing to pay handsomely to help BMW do its R&D – more than 500 people applied for the 40 places available on the UK trial. The shortlisted applicants will be hearing from BMW very shortly, apparently. We wish them luck, and we await more news of the BMW Mega City Vehicle with interest.